Minecraft for the 360 has come out today and it comes with a funny bug on the xbox site, for the UK/British market. Though, with it release comes one but on the xbox site, in the US the price is listed at 1600 microsoft points ($20). In the UK it at first was listed at -1 Microsoft point, which then became over 4 billion microsoft points (4294967295 to be exact) which turns out to be £41840139.73 or $57266230.61. Anyone up to pay that price? Though this problem has been fixed, I find it amussing. Got to love unsigned intergers. I actually think I'm gonna buy it. It costs less than regular Minecraft, and it looks like it'll be more enjoyable. Honestly, I wish they had just improved what they already had instead of constantly adding **** when it came to Beta 1.7.
n the UK it at first was listed at -1 Microsoft point, which then became over 4 billion microsoft points (4294967295 to be exact) which turns out to be £41840139.73 or $57266230.61. This has happened before. Fairly recently actually. Ah it has do you recall with what game it was with perhaps, from what I heard from Cat, who has played the demo it's pretty good. Though, it's a bit odd when your use to playing it on a computer to have it on the computer. Oh Xbox 360 downstairs in the basement... why can't you belong to me? ;n; I don't have money to purchase it anyhow so it would not matter if it were my system to be purchasing things for. Besides, I have it on the PC so I don't realllly need it again. x3 But I look forward to seeing more information on the new release of ol' Minecraft and hearing people's opinions about it. I saw the funny Twitter posts from Notch when referring to that silly glitchy, it was amusing to see. Last edited by LugiaDialga; May 10, 2012 at 02:03:13 PM. I quite like it, purely for the split-screen aspect. Nothing beats getting a few mates together in front of a single screen to play a fantastic game. Last edited by Shiny; May 19, 2012 at 07:09:44 PM. I got it because I dont own MC on PC (I play my friend's profile at his house). It's alright. Nothing compared to PC but it will be updated eventualy. Next update is gonna be 1.7.3, im pretty sure ( according to the Wiki). Nonetheless it's still playable and I hope they continue to update it. There seems to be an update that will be going out tommorrow/today/already has come out for the 360, from the looks of it some of the features would be quite nice, I haven't saved up points enough or got enough points to get it myself but some of the new features that will be addes those who already have it probably will appreciate. There seems a little has been added, like for example a change in sensitivity in game vs when your in the menues. Most of the fixes seems to do with online and multiplayer stuff, not a bad idea good in the long run. I'd still like the ablity to have custom skins and other small features, not to mention for it to catch up with the PC version. We can hope for that much in the next update. I'd much rather have it be updated to the PC's curent version rather than having custom skins. But I really just want Creative mode. Dupication Glitch gone, Walk through Sugar Cane, X, Y, Z coordinates on Map. That's all I found new. Hm, I'd like to see them add the new Nether and more of the items and mobs (ocelots kthx). I'm not particularly a fan of the hunger aspect, though. Yeah, nether has still no other purpose.. So.. Is this gonna be a Minecraft 360 Discussion thread? Or are we gonna have a whole different thread? I've changed the title to what you see now. This will be the MC: Xbox 360 discussion thread because it seems discussion on it is already happening on this thread. New update comes out at 2 AM UTC. Updates the game to 1.7. Pistons, sheers, new textures, etc. Also they're adding a banlist which I have no idea what it does, and custom skins, which seem like a ripoff. Ohhh your marvin martians O_O. lol i just noticed that. But anyways on topic, oooooh, where'd you find this out? Also word of mouth and other gaming sites. There's also other upcoming skin packs you can view here. Last edited by Shiny; July 12, 2012 at 10:49:01 PM. Reason: I accidentally the spoiler. WHOA. THE HALO CHARACTERS AND THE GEARS CHARACTER. I WANNA SEE HOW THE HALO'S LOOK, I CAN'T FIND A PIC! New update on Minecraft 360 as the new update may be out this month, or at least by the end of this month. I defininitly prefer the PC version, but the X360 version is great when your PC is broken. I prefer the updatedness of the PC version, but I vastly prefer the simplicity of the crafting interface on the 360 version. I also like playing the game with a controller. Yes, I definitely find playing with a controller MUCH more easy.. Seems there is updated information on the updates of the 360 version. I HAVE SO MANY UPDATEABLES. OMFG I WANT THIS TO COME OUT ALREADY!!!!!!!!! AHHHHH I LOVE IT!! Can't wait to try out creative mode and the new controls.. Could you always block with a sword in the 360 version? No, the current version does not allow you to block with a sword. THey see me mining, they hatting in. Funny bussiness asside. Seems the Minecraft has become the number one seeling game on the xbox market, passing up the 4 million mark for sales. Which makes it the highest seeling gamin the the markets 7 year history. Give a round of aplause for minecrafts succes. 1.8.2 is on the way and you can get a look at it in the following link which has a link to that. So the updates been turned into Microsoft cert testing which takes about 7 to 10 days from what I've heard. They have released a skin pack that adds half life 2 characters to the mix. Wish you could do a custum on through their site or something for you to download but heres teh article with pictures. Also adds Cowman, Pigman (yes like the one from the nether), Zobie Steve (from what I saw) and Skeleton. Last edited by GreenMan; October 13, 2012 at 10:20:32 AM. Wow I can see how active this thread is. Down to business. Seems that the xbox 360 version will finally get an update, which is tommorrow Oct 16 2012. Once its out and you've got a chance to fiddle with it let me know what you liked or didn't like about it. Lets go miners, lets get mining. Last edited by GreenMan; October 15, 2012 at 03:07:49 PM. Glad to see we are having lots of talking here. Warning in coming update, warning. This just in, apparently has caused the spirt of giving instead of the spirit of scaring other people as later this month they are going to realease a skin pack with 55 skins and wait for it, any money that is made in the sales will be going to charities. The skin pack is going to go on sale for 160 MSP ($2) and all the money goes to charity. I myself will be getting it, 2 bucks that goes to charity and you get 55 skins. Companies that donated skins include: 434 studios, Rare among smaller companies that I didn't regonize. So what's your thoughts, this a good idea? Are you planning on getting this yourself. The update for Minecraft is out, enjoy the scares and thirls. Hm, I don't really think that's a hidden feature. I recall doing it a few times back when that was the standard PC version. As for stuff I've done lately, I tried playing around with TNT. It seems to either work really well or lag a lot. Anouther update set to hit out on the xbox 360 tommorrow so enjoy. Oh no. Cakes are stackable?! Ohhhh crap, here comes some MAJOR trolling of my world.. For those of you that don't know (probably all of you), all my friends come into my world sometimes and when they want to fool around, they place cakes everywhere....... .-. nothing, except for the fact they cover the rooftops of my buildings with cake, the floors are cake, cakes were in my bedroom... They're everywhere. That just means food for days and you don't have to harvest anything. .... But we have our world on creative. Harvesting doesn't matter..food doesn't matter.. If you're not playing on Survival, you're not playing MC. Essentially and Etch-a-Sketch with access to TNT. You're not supposed to play MC just for creative mode. That's like playing Pokémon just to turn all the cheats on. A little tip - building cool stuff is more rewarding and satisfying if you do it in survival. well if it counts, I built a pokeball, pacman and Iron Man by myself on survival? Simply because the first was built in survival, so instead of having an infinite amount of specific blocks, I had to harvest the materials gradually over time, giving me a sense of nearing completion and satisfaction. Personally, I use creative mode just to test redstone contraptions and goof off with TNT. Creative is great for artists and blueprint design for actual Minecraft projects. It's also great for musicians. Oh, and item abuse! Can't forget that. Halo 4 has been taken down, the beast that it was. Wow. That is amazing actually, I never saw that coming.. That's crazy, but congrats to Minecraft! I'm not too surprised. After all, this is a game that sold just over 450K copies on Christmas day alone. It's amazing to see how far Mojang has come since starting off as just an indie developer of an incredibly simple concept for a sandbox game. Seem that "THE END" has been put off for the 360 version until after the "Title 7 upadte" bugs. The Title 8 update will primarly be focused on fixing some of the bugs that Tittle 7 has brought. 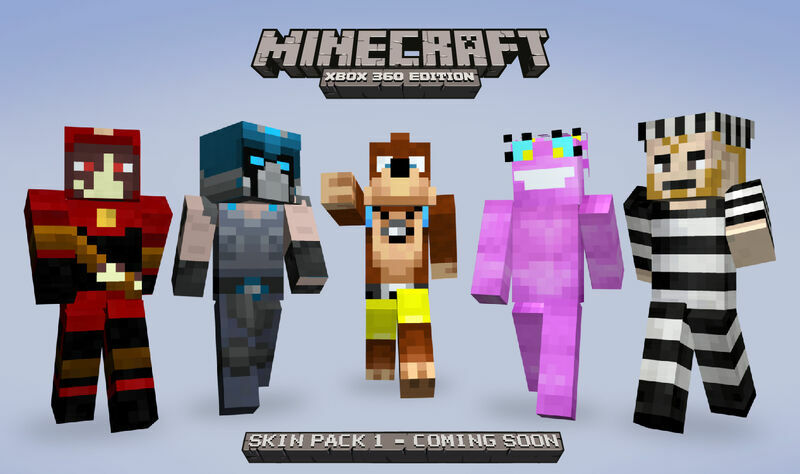 A fourth Skin pack is in the works though right now no details on who will be making their apperence in it. Aw man... I was pumped for the end to come.. Oh well, still kinda hyped for this skin pack.. Now, if only I could get some Microsoft Points!.. The real winners here: Mojang. Seems the Minecraft will be avaiable for you to get on disc, what are you thoughts on it yay or ney? New teaser trailer fro the new TU9 update. The games getting caught up man. I'd buy it if I didn't already download it. Seems like they're actually being zippy about it. YES THE NEW UPDATE HAS BEEN RELEASED!